I am not unused to seeing my name in the Bible. The story of the Visitation when Mary travels to be with Elizabeth during her pregnancy is one of my favorites. I knew that Mary, Martha, and Lazarus were from Bethany. And I’d heard or read the names of places like Bethsaida and Bethesda, too. For goodness sake, Jesus was born in Bethlehem! How cool is that?! I’m also not unused to opening the Bible and finding some nugget of truth that speaks to me in the moment. That’s one of the beauty parts of reading the Word. Eternity lives in these books that were written thousands of years ago, yet still hold an indescribable depth of meaning today. Solace, instruction, mission, inspiration…I’ve come to find all of these and more. But never, until a few days ago, did I feel like God was speaking directly to me. Like I said, I was used to seeing variations of my name in the Bible. I know that “Beth” is Hebrew for house. But never before that day had I seen the word Beth used by iteself. And, read all in one breath, it seemed less like a title or subheading and more like a direct address to me. 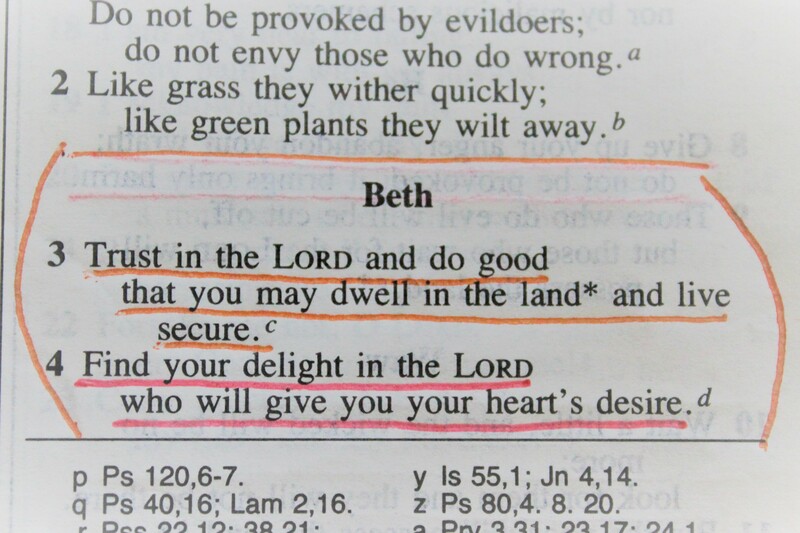 It was as though God Himself or the psalmist David were saying, “Beth, trust in the Lord and do good…” It was awesome. Looking at the footnotes for this particular psalm, I found that each section of Psalm 37 begins with a different and successive letter of the Hebrew alphabet. Aleph, Beth, Gimel, Daleth and so on and so forth all the way to Taw, twenty-two in all. So what had seemed to me as a straight up message from the Lord? It was simply a way for the psalmist to lay out clear clear and concise instructions for the people of Israel. He was responding to the problem of evil, how to avoid it, and what will come of it. But then I got to thinking. These instructions here? The ones I naively looked at as directed to me… Aren’t they appropriate for all of us? Can’t these deceptively simple words lead us on a better path? Trust. Do good. Dwell in the land. Live secure. Yes, please! I would like to do those things! Wouldn’t you? 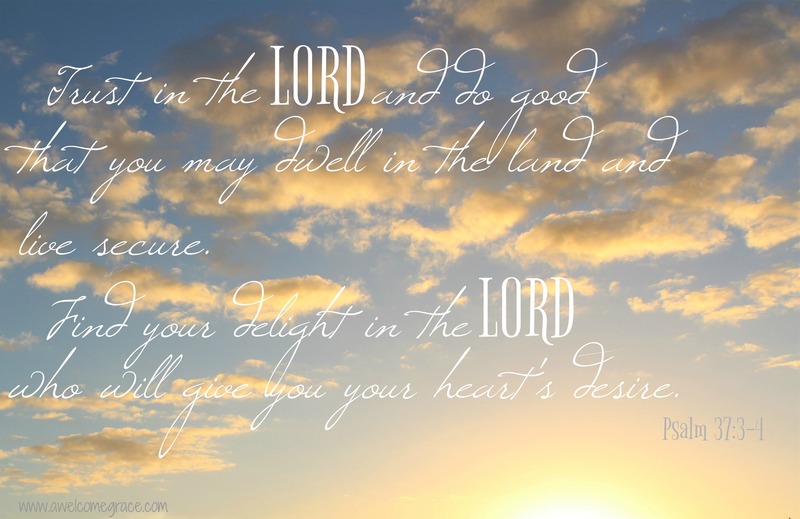 The psalmist admonishes us to “Trust in the Lord and do good that you may dwell in the land and live secure.” What is the “land” to which he is referring? Heaven, of course! By placing our trust in Him who created us and doing good things in our own lives and the lives of others, we can have the hope of heaven where we will live in peace for all eternity. That sounds like a plan to me. Trusting and doing good, though, aren’t always easy. Our human nature doesn’t let us trust easily, especially if we’ve been let down before. But we have to remember that God will never let us down. Even if we don’t know His plan. Even when we feel tested and alone. We place our trust in His constancy and providence in our lives and we have hope. And doing good? Our pesky human nature acts up again. Selfishness, ego, and laziness can all stand in the way of our best intentions. We fight the good fight, though, and we persist. Being ever on the lookout for ways to improve and show God’s love and light to those around us. And our reward? God willing, we will be invited to live forever with Him in heaven. Safely taken home at the end of our days to be reunited with our maker and to join with the faithful of the ages never to hunger, thirst, or suffer again. Look around you. Look at all of the gifts you’ve been given in your life. Where have all of these things come from? Have they landed in your lap by happy accident? Are they the result of a series of cosmic blips? I think not. Maybe you say that all you have has been brought about from hard work. I won’t argue with that! But think of all the times people work hard and don’t find the success they sought. No. I would argue that “every good and perfect gift is from above” (James 1:17). We need to recognize the captivating ways God’s love is at work in our lives and delight in each and every one. Give Him thanks in our joys and in our sorrows, confident that His plan is always for our good as we are told by the prophet Jeremiah (chapter 29, verse 11). That future full of hope is waiting for us, friends. It’s the desire of our hearts that we sometimes can’t even put into words. It’s a longing for love and acceptance and home and peace. So, there you have it. My rather feeble attempt at sharing how God spoke to me on a random October morning. I feel like I was given my marching orders in these simple verses. The words are so direct, so simple, yet contain so much hope and promise and action. I hope that you, too, will find your direction here. Replace “Beth” with your own name when you read it. See how God speaks to you in His word. And then embrace it and make it your own.